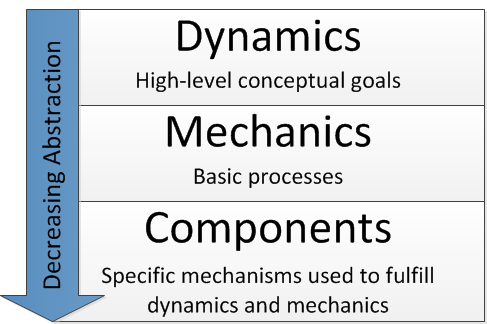 Gamifying a system involves high level conceptual work, and one model which can help you go from general to specific is Ward’s three levels of design abstraction. 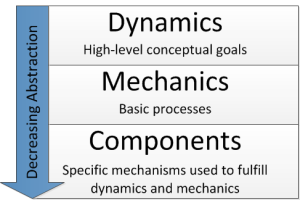 The three levels discussed Werbach and Hunter’s For the Win are dynamics, mechanics, and compoments. In this post, we’ll examine the very high abstraction level of dynamics. Constraints are your limitations or forced trade-offs. What will you NOT allow your users to do? What will you not allow your AI to do (like always win!)? What feelings do I want to encourage in my players? What emotions do I want to mitigate? How should this game make you feel? Most games need a consistent, ongoing story line to help give the game a sense of progression, and perhaps even archetypal meaning to the players. What is the narrative arc that best represents the development of the player, and the content and style of our game? Are there multiple races or player types with backstories and familial histories? What attributes will indicate progression? Ranks? Levels? Both? What are the overall ranks? How many? Is there leveling within the ranks? If so, are they numbered? In addition to defining your progression stairs, you need to consider which types of progressions you will measure and reward. What does the final state of an advanced player look like? The social interactions generating feelings of camaraderie, status, altruism, and so on you want to encourage. Will there be cohorts or teams? Understanding these three levels of abstraction can help you design a good system. Having the high level concepts of your desired dynamics defined allows you to move on too the specific mechanics you will use to meet those goals.